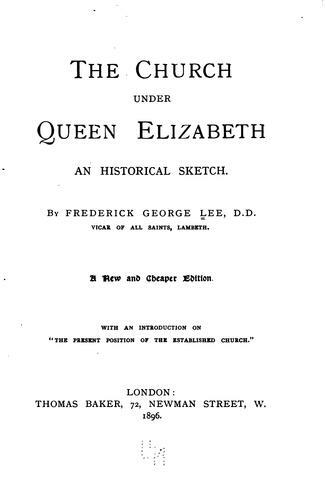 Publisher: Appendix I: A list of martyrs who suffered under Queen Elizabeth, p. 357-376.--Appendix II: Societies relating to reunion, p. 377-386.. Appendix I: A list of martyrs who suffered under Queen Elizabeth, p. 357-376.--Appendix II: Societies relating to reunion, p. 377-386. 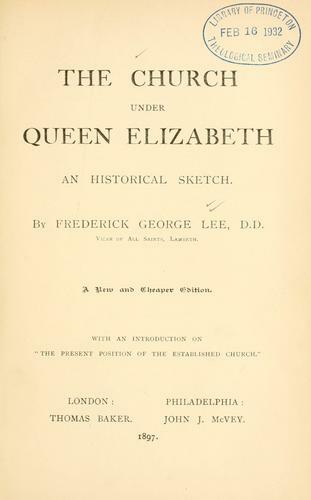 Find and Load Ebook The church under Queen Elizabeth. The FB Reader service executes searching for the e-book "The church under Queen Elizabeth." to provide you with the opportunity to download it for free. Click the appropriate button to start searching the book to get it in the format you are interested in.